What is this I see? Is it a light? Yes, I think it is! I am in a stress tunnel of three jobs, a half painted house, and a blog and I see a light! It’s not very bright, but it’s better than nothing. In case you’ve been wondering why I still don’t blog much even after having moved in, it’s not just because I’m still only half unpacked. Final Fantasy XIV launched it’s early release, so my nights and weekends have been filled with data entry, site design/feature arguments, and attempts to play the game. I am juggling this plus my two real halftime jobs at the university, which will become one full-time one on Friday. 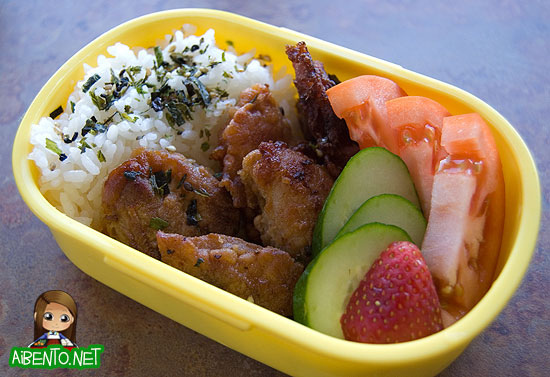 Here is a mochiko chicken bento that I made… well geez, I can’t even remember when I made it. All I know is that it was last week sometime. 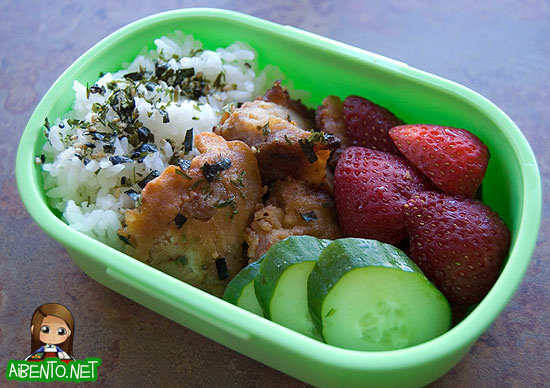 I threw it together in about 5 minutes, using leftovers and adding some fresh veggies and half a strawberry for color. I actually have windows in my kitchen now, so this is why my photos are so bright without any hotass lamps and lightboxes and stuff. Now I just have to figure out where the heck I put my background materials….. I made this second one for Baby Girl, but the little brat didn’t eat it because it was “too cold”. Thermal lunch jars have spoiled her rotten, apparently. She ate just the strawberries and one piece of chicken. *rage* I mean, for one, she didn’t eat lunch basically. And two, she wasted all that food! Grr! The event takes place at the Neil Blaisdell Exhibition Hall and I will be in the Demo Room. Hope to see you there!